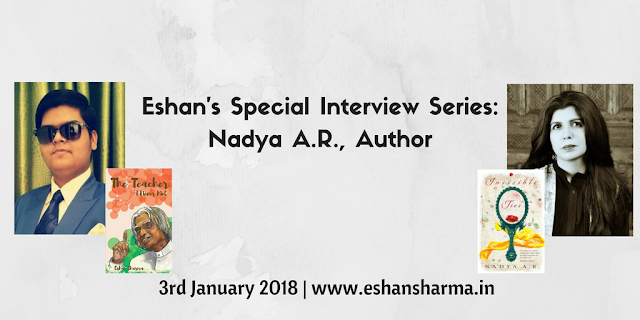 Eshan's Special Interview Series: Nadya A.R. Today we have a very special guest with us, Nadya A.R., let's know more about her. Thanks so much Eshan for having me as a guest on your blog. I am a writer and a psychotherapist by profession. I wrote my first book of short stories, Broken Souls, in my twenties when I was doing my Bachelors in Business Administration. Then, I changed my career path and pursued my interest in Psychology. I did diplomas and a post-graduate degree from University of Birmingham in understanding the aetiology of social, emotional and behavioural difficulties. My first novel, Kolachi dreams, was published in 2006. Later on, I moved to Singapore and completed my Master's degree in contemporary psychotherapy. I researched on childhood attachment issues and how they affect us and our relationships, later on in our lives. I became extremely interested in a theme which explored internal versus external security in relation to a female protagonist. And began working on my second novel, Invisible Ties, which has been published by Rupa Publications this year. Writing requires a lot of passion, focus, discipline and stamina. I think not only do you require the mental skills but also you require the physical strength to complete the enormity of the task you have undertaken, which may seem like a whim, a fancy or even a hobby to many others who matter to you. I find the time and the luxury to dream, to be creative without judgement or reward, to follow the pure passion to write for myself and to balance writing with my other responsibilities, extremely challenging when it comes to my own writing. I have been writing since I was a child. I used to write poems which were now I feel quite morbid and depressing. Later on, I started keeping a journal and wrote all my thoughts and feelings which I felt strongly about and couldn’t really share with anyone. I also read extensively and wrote short pieces on the books I read and explored them in detail, both at a technical and emotional level. And gradually, I started work on short stories, and finally progressed to writing a novel. Sadly, quite long. Just to give you an idea, my current novel, Invisible Ties, took me almost four years to write. I am obsessed with diaries, notebooks, pens, and the stationary which surrounds my workplace. I organize my thoughts by writing them randomly in beautiful notebooks, then further work and expand on them by thinking where they will fit in my writing journey. While I was writing, Invisible Ties, I literally had a notebook or few notebooks which I kept for each chapter in separate marked folders. Simultaneously, I worked on the research that was needed for the book and each chapter and then started writing my first draft and subsequent drafts with the material garnered from my random thoughts and of course planned research. So, my writing is an interesting blend of both these elements, the known and the unknown. For me, you are destined to write because it is an art which is just beyond you and your comprehension. Artistes are born to create and will create, regardless of the circumstances thrown at them. Of course, one has to work at and hone your skills, whether it is by studying or by practising it. My father is a poet and he has published three beautiful books in Urdu. My younger sister, who is a lawyer, is also a published writer. So in a way, my DNA is perhaps wired to create and is the prime reason to write my books. However, I also feel strongly about individuals who can’t fit neatly in our society, people who are marginalized and the social and cultural anomalies which do exist in the South Asian context and are hindering our progress in the world today. My first book was a compilation of short stories, Broken Souls, and highlighted the perils of child labour in the carpet weaving industry as well as the inequity which plagues the third world. So, my main focus was to create sketches and stories depicting children and women, who were living on the fringes of society. I am working on my next novel, The Sanctuary, which is an adventure novel. Presently, I am still in the researching stage and haven’t yet started the actual writing. I think my best accomplishment is that I have continuously strived to improve my writing. 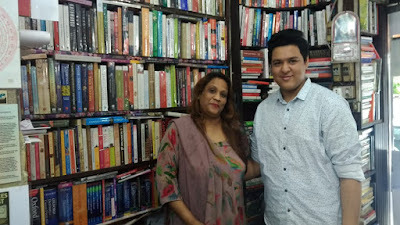 After my first novel, Kolachi Dreams, I attended the summer school at Exeter College, Oxford University, did a diploma from London School of Journalism, and worked with different mentors while writing a novel that I never completed, and then my current novel, ‘Invisible Ties’. The ability to be open to growth and also set higher standards for myself motivates me to improve my work. Q10.What do you think about the flow of literature among different countries? I strongly believe that art has no boundaries. It is imperative that we open our mind and heart to diversity. In a world which has indeed grown smaller with the latest technology, we must avail this wonderful opportunity to read literature and embrace writers from all over the world. It helps us to glean knowledge, broaden our world-view and also encourages competition at a global level. At the same time, physical distances and alienation from other cultures are bridged by reading the experiences of different literary voices and feeling empathy for them at a conscious and unconscious level. Q11. What’s something you are really good at that few people know about? I am very old-fashioned and love the etiquette of the olden days. So I still believe in greeting everyone that I meet properly, thank everyone and remember to wish people on their birthdays. I like the personal touch, which I feel is somehow lost in the internet modern age. I still write cards, long letters and deeply care about people more than possessions. I come from a very close-knit family and value my parents, siblings and children, more than anything else in the world. Ans. I think it was the research, the details and somehow juggling everything around to focus only on writing, ‘Invisible Ties’. I really had no life apart from the book and was totally committed to finishing it. It did take its toll on me mentally, physically and emotionally. Writing can be very draining and exhausting. However, when you have completed this enormous task, the sense of elation and accomplishment you feel is somewhat indescribable. Ans. I strongly believe in the future of reading and writing. We will only evolve and grow as humans, if we hold the pen in our hands or whatever device in the future, and learn to decode the written words and are able to unravel the truth in them. Hopefully, with a more civilized and enlightened world, we will have blurred boundaries, more constructive exchanges and greater love for humanity. Ans. Perhaps, I would have done a degree in creative writing and done more writing courses. I strongly believe in life-long learning. Q16. Let me now ask something about myself, how was the interview?? Something you want to say about me? Ans. Thanks for the interview, Eshan. I found it very detailed and the questions intelligent and relevant. The youth are the future of this world. I enjoyed reading your book on Mr Abdul Kalam. It was highly readable and a commendable effort from someone, who is just seventeen years old. It is also very inspiring as Mr Kalam was a multi-faceted personality, and one can learn so many lessons from his life. I have always loved stories about people who make it in life against all odds. People who believe in their dreams, and tirelessly work towards them. In the true sense, Mr Kalam defeated and surpassed all the fears of failure which cripple so many of us. In the same way, you chose to write a book and your age didn’t deter you. So you were already applying and following the philosophy of your role model, Mr Kalam. And, I wish you all the very best and great success with your writing. Ans. I love nature and long walks in the park. Ans.Paulo Coelho, Khalil Gibran and Kiran Desai. Ans. Invisible ties is a saga of love, loss and displacement, set in Malaysia, Pakistan, Singapore and London. It is the story of a woman in her twenties, Noor Kamal, and her journey of finding, accepting and learning to love herself. In a turbulent Karachi, and as a mere child, Noor steals her mother’s antique dragon jade mirror. The mirror becomes her secure base, in her childhood spent with caregivers and household helpers. After a daylight robbery in her house and the killing of her driver, Joseph, a traumatized Noor decides to marry Meekaal Kalim, a banker based in Singapore, under pressure from her mother. However, in Singapore, she starts questioning her husband’s real intentions to marry her. In her confused state, she enrols in a course in psychotherapy. Then she meets Ella, her childless neighbour and a handsome American, Jake, and through her interactions with them, she expands her world-view, learns to negotiate the terms of her marriage and takes charge of her destiny. The novel’s title-Invisible Ties- suggests that we are connected to other people in ways which we may not be aware of but these ties are meaningful for us. The most important tie is humanity, and should not be compromised across all boundaries and borders. Ans. I think the mere joy and elation of being published by Rupa. And then, the support of so many people and The National University of Singapore coming on board for the launching of the book in Singapore. Ans. No, your interview is very detailed and thorough. Ans. Just write for the sheer joy of creating and passion for the written word. Don’t get dejected by rejection, as everyone has gone this route, including me. Ans. I would like to thank all of them for reading, Invisible ties. Please get in touch with me. I would love to hear your feedback and what you think about my book. For me, my readers are the most important part of my journey, and I hope to grow as a writer with the help of their insights and wisdom.